What Would Happen if the Sun Went Supernova? This would be the end of life as we know it. First, if the Sun went supernova scientists would be terribly, terribly confused. In order for a star to go supernova, it has to have a mass greater than at least 8 solar masses. Although there is some debate about the exact threshold, the Sun is not nearly massive enough, not even close. So if it went supernova it would be really weird. In fact, it would be “totally defying the laws of physics” weird. In essence, a supernova is a violent stellar explosion. Perhaps “violent” is an understatement. These explosions are roughly the equivalent of a few octillion nuclear warheads, and a few octillion nuclear warheads going off in your neighborhood is extremely detrimental to any life in the area. An explosion of this magnitude releases incredible amounts of energy—as much as the sun creates over the course of its entire life. Which means radiation, lots and lots of radiation. This is not so good for our ozone. Scientists theorize that the Earth’s ozone layer would be damaged if a star less than 50 light-years away went supernova. And as a reminder, the sun is about 8.3 light-minutes from Earth. Big frown face for us, because 8.3 light-minutes is a lot closer than 50 light-years. Of course, just as a reminder, the Sun is not nearly as massive as the stars that actually do go supernova, so assuming that it did (for some strange reason), it would still be very bad. If our ozone was impacted enough to cause even a 10 percent increase in ground-level ultraviolet (UV) radiation, it could kill much of the Ocean’s phytoplankton, effectively bringing an end to all marine life. If we lose 2/3 of our ozone, the UV radiation on mid-latitude cities like Washington, D.C. would be strong enough to give you a nasty sunburn in just five minutes. If the Sun went supernova it would have a much more dramatic effect. We would have no ozone. With no ozone, skin-cancer cases would skyrocket. All living things would suffer from severe radiation burns, unless they were underground or in protective suits. Plants would fry, animals would fry…we would all die. However, if the Sun went supernova the loss of ozone would be the least of our concerns. There would be no escape. 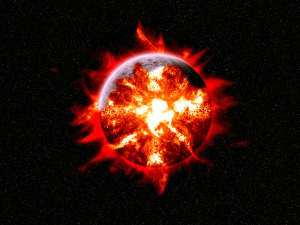 On the side of Earth that faced the Sun, the explosion would boil away the surface of the Earth at hundreds of meters per second. People on the night side wouldn’t do much better. Scattered light would heat Earth to lethal temperatures. 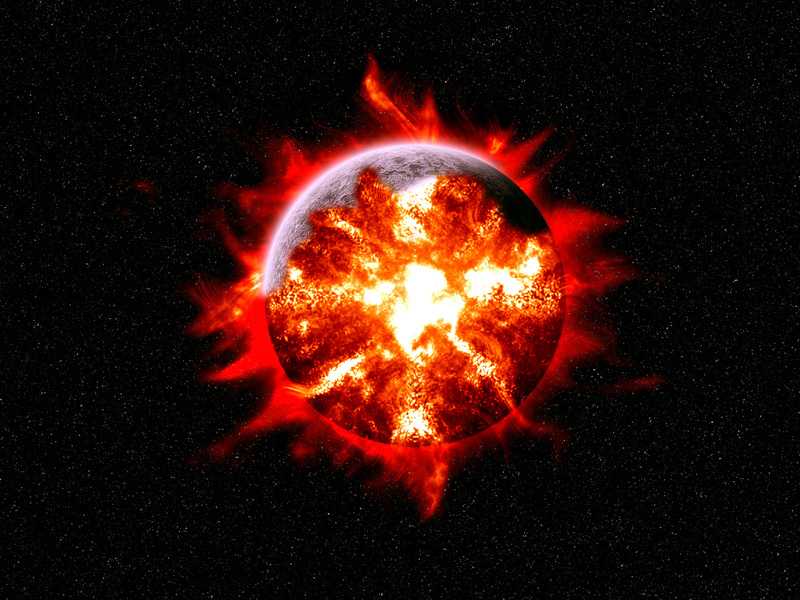 Scientists estimate that the planet would be roughly 15 times hotter than the surface of the Sun currently is. Far above the boiling point of any known material, and much hotter than any human can withstand (obviously). At best, the Earth would take a few days to vaporize. Even were we to flee to Pluto (which would take roughly a 10 years with today’s technology) we still wouldn’t survive. The tiny dwarf planet would also be heated to temps hotter than the surface of the Sun. Poor Pluto, first it’s not a planet and now this. What Would It Be Like to Spend A Day in a Black Hole?